Have you ever wondered what a rehearsal looks like? As New Surry Theatre prepares for their upcoming Directors' Festival, and in celebration of Word, they are opening a play rehearsal to the public! 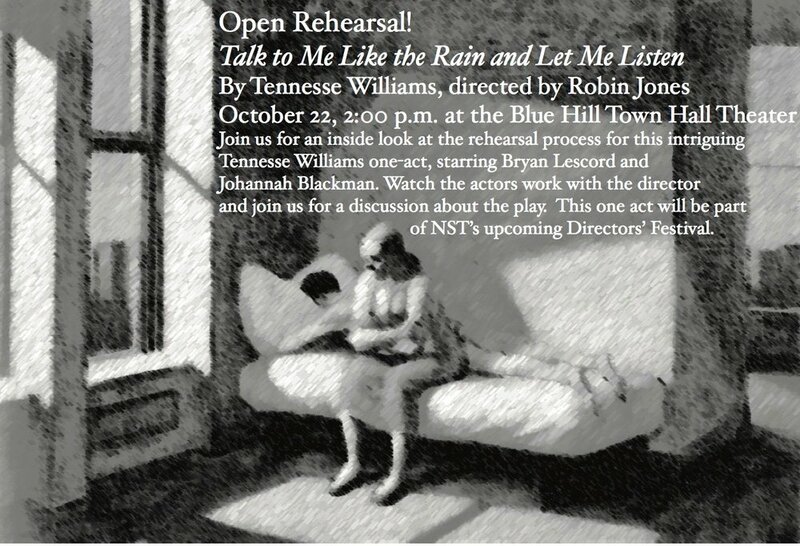 Join them Sunday, October 22, for an open rehearsal of Tennessee Williams' one-act "Talk to Me Like the Rain and Let Me Listen". Watch director Robin Jones work with actors Bryan Lescord and Johannah Blackman as they dive into the meaning of this intriguing play and join them for a discussion afterwards. Free and open to all at the Blue Hill Town Hall Theater.